Vertebroplasty—An acrylic cement is injected into a fractured and collapsed vertebra (spinal bone). The cement strengthens the bone and decreases pain from the fracture. Kyphoplasty—A balloon is used to create a cavity to inject the cement into. This procedure is designed to relieve pain. It can also improve spinal deformities from the fractures. 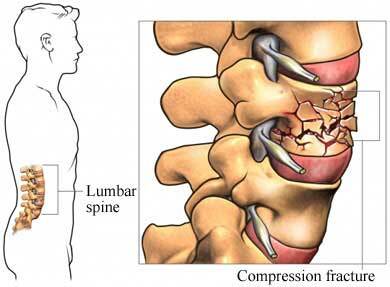 Both procedures are used to decrease pain from osteoporosis or vertebral compression fractures . Kyphoplasty also restores the height of the bone. This can decrease nerve compression and the spinal deformity caused by the fracture. Other treatment for vertebral fracture may include nonsurgical treatments such as bracing or use of pain medications. If you have vertebral fracture due to osteoporosis , vertebroplasty may not be as effective. The procedure is not used in young people with an acute fracture and healthy bones. You will receive a complete physical exam and blood tests. You will need to stop eating at least 6 hours prior to the procedure. Stop drinking fluids about 3-6 hours prior to the procedure. Most are done using only IV sedation and local anesthesia. The sedation will help you relax. The local will numb the area above the fractured bone. In some cases, general anesthesia may be used. You will be asleep during the procedure. You will be asked to lie down on your stomach. X-ray cameras will be positioned around you. The cameras will show images of the bone. Your doctor will use this to verify the position of the needles and cement. The skin over the fractured bone will be numbed and sterilized. A hollow needle will be passed into the vertebra. The acrylic cement will be mixed into a toothpaste-like consistency. An added substance, called barium, will improve the images. When the needle position is ideal, the cement will be injected into the fractured bone. The doctor will watch the cement as it enters the bone to check for leaks. Your doctor will begin by making a small incision in your back. A tiny drill will be used to create an opening in the bone. A special balloon will be passed through. The balloon will be inflated to open the space and correct the deformity. After the balloon is removed, acrylic cement will be injected into the cavity. This will help to maintain the correction. Other methods can be used to open the space before injection. You may have a CT scan to confirm the position of the cement. You will stay on your stomach for about 10-20 minutes. This will allow the cement to harden. You will then be moved to a recovery room. You will be asked to lie on your back for another hour or so. 40 minutes to 2 hours, depending on how many vertebra are injected. You may feel some initial pain due to lying on your stomach. Many notice immediate and significant relief from pain. You will usually only need to stay in the hospital for a few hours. You may need to stay longer if you have any complications. You will be monitored for a few hours for any complications. You may notice some discomfort at the site of the needle insertion or the tiny incision. This is often relieved through the use of an ice pack (use only for 15 minutes per hour). Acetaminophen or nonsteroidal anti-inflammatory drugs (NSAIDs) may also help. You may also be given medication to prevent muscle spasm. Buchbinder R, Osborne RH, Ebeling PR, et al. A randomized trial of vertebroplasty for painful osteoporotic vertebral fractures. N Engl J Med. 2009;361(6):557-568. Kyphoplasty. Johns Hopkins Medicine website. Available at: https://www.hopkinsmedicine.org/healthlibrary/test%5Fprocedures/orthopaedic/kyphoplasty%5F135,36. Accessed December 19, 2017. Vertebroplasty. Johns Hopkins Medicine website. Available at: https://www.hopkinsmedicine.org/healthlibrary/test%5Fprocedures/orthopaedic/vertebroplasty%5F135,37. Accessed December 19, 2017. Vertebroplasty for spine fracture pain. Family Doctor—American Academy of Family Physicians website. Available at: https://familydoctor.org/vertebroplasty-for-spine-fracture-pain. Updated: May 2014. Accessed December 19, 2017.